Come join the first North American House-Cat! Photo by Michaela Begsteiger for the Muchar brochure. Come out and be a part of history by participating in the first North American House-Cat! 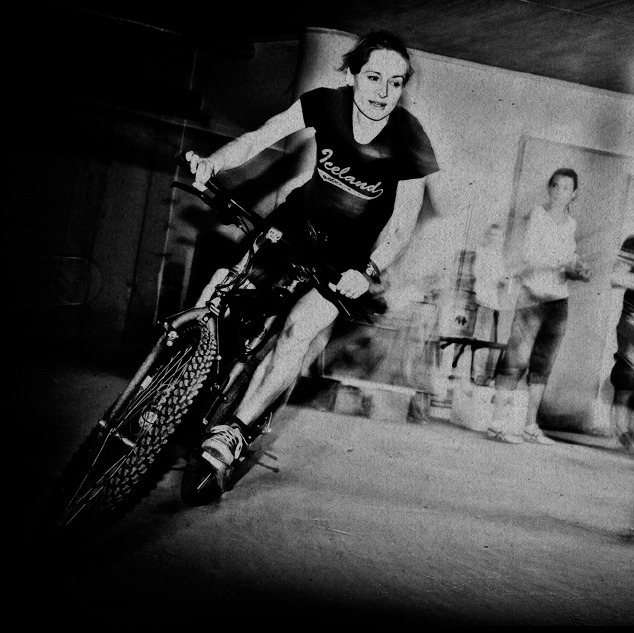 Also known as indoor bicycle racing, Africycle and PEDALBELT are sponsoring the event, which will be held at Handlebar in Kensington Market on August 10, 2014, in the afternoon. Brought to you, all the way from Graz, Austria, the "house-cat" by Muchar was featured in the Bicycle Film Festival and Boneshaker magazine two years ago. Now it's Toronto's turn to try! Here's a news clip from Graz that shows a similar event at a bar. There is a maximum of 40 racers allowed and the cost of participation is $10 per competitor. Registration will be on a first-come-first-serve basis. The race will be announced and registration will begin two weeks prior to that date through Facebook, Twitter and on the Altbaukriterium website. Those wishing to register should send an email to muchar@gmx.net. Any foot down or touching of walls or furniture with one’s hands results in a one-lap penalty. A crash results in a 10-lap penalty. One lap is completed when the crank set crosses the start line. Competitors have to be invited. No training without an official starting number. Unicycle, tandem bicycle, support wheels or motors are not allowed. In addition to the House-Cat, Africycle will also be collecting bicycles before the event on Augusta Avenue. Africycle works in Malawi, where they ship the bicycles they collect here to give to health care and social workers who deliver vital care to rural populations with extremely limited access to services. The bicycles also allow families greater access to clean water, markets, education and jobs. So come out to support an excellent cause that promotes cycling worldwide and have a chance to participate in history. It promises to be a fun-filled afternoon with a little healthy competition. Check out the promo and Muchar on Vimeo. Alley cats are unsanctioned urban bicycle races that began in Toronto in the late 80s.